Create a source endpoint, a target endpoint, and a replication instance before you create a migration task. Migrating Data to the Target Database – This process creates files or tables in the target database and automatically defines the metadata that is required at the target. It also populates the tables with data from the source. The data from the tables is loaded in parallel for improved efficiency. This process is the Migrate existing data option in the AWS console and is called Full Load in the API. Capturing Changes During Migration – This process captures changes to the source database that occur while the data is being migrated from the source to the target. When the migration of the originally requested data has completed, the change data capture (CDC) process then applies the captured changes to the target database. Changes are captured and applied as units of single committed transactions, and you can update several different target tables as a single source commit. This approach guarantees transactional integrity in the target database. This process is the Migrate existing data and replicate ongoing changes option in the AWS console and is called full-load-and-cdc in the API. Replicating Only Data Changes on the Source Database – This process reads the recovery log file of the source database management system (DBMS) and groups together the entries for each transaction. In some cases, AWS DMS can't apply changes to the target within a reasonable time (for example, if the target is not accessible). In these cases, AWS DMS buffers the changes on the replication server for as long as necessary. It doesn't reread the source DBMS logs, which can take a large amount of time. This process is the Replicate data changes only option in the AWS DMS console. Determine how the task should handle large binary objects (LOBs) on the source. For more information, see Setting LOB Support for Source Databases in an AWS DMS Task. Specify migration task settings. These include setting up logging, specifying what data is written to the migration control table, how errors are handled, and other settings. For more information about task settings, see Specifying Task Settings for AWS Database Migration Service Tasks. Set up table mapping to define rules to select and filter data that you are migrating. For more information about table mapping, see Using Table Mapping to Specify Task Settings. Before you specify your mapping, make sure that you review the documentation section on data type mapping for your source and your target database. You can choose to start a task as soon as you finish specifying information for that task on the Create task page. Alternatively, you can start the task from the Dashboard page after you finish specifying task information. The procedure following assumes that you have chosen the AWS DMS console wizard and specified replication instance information and endpoints using the console wizard. You can also do this step by selecting Tasks from the AWS DMS console's navigation pane and then selecting Create task. Shows the source endpoint to be used. Shows the target endpoint to be used. Shows the replication instance to be used. When this option is selected, the task begins as soon as it is created. Do nothing – In Do nothing mode, AWS DMS assumes that the target tables have been pre-created on the target. If the migration is a full load or full load plus CDC, you must ensure that the target tables are empty before starting the migration. Do nothing mode is an appropriate choice for CDC-only tasks when the target tables have been pre-backfilled from the source, and ongoing replication is applied to keep the source and target in-sync. You can use the AWS Schema Conversion Tool (AWS SCT), to pre-create target tables for you. Drop tables on target – In Drop tables on target mode, AWS DMS drops the target tables and recreates them before starting the migration. This ensures that the target tables are empty when the migration starts. AWS DMS creates only the objects required to efficiently migrate the data: tables, primary keys, and in some cases, unique indexes. AWS DMS doesn't create secondary indexes, non-primary key constraints, or column data defaults. If you are performing a full load plus CDC or CDC-only task, we recommend that you pause the migration and create secondary indexes that support filtering for update and delete statements. You might need to perform some configuration on the target database when you use Drop tables on target mode. For example, for an Oracle target, AWS DMS cannot create a schema (database user) for security reasons. In that case, you have to pre-create the schema user so AWS DMS can create the tables when the migration starts. For most other target types, AWS DMS creates the schema and all associated tables with the proper configuration parameters. 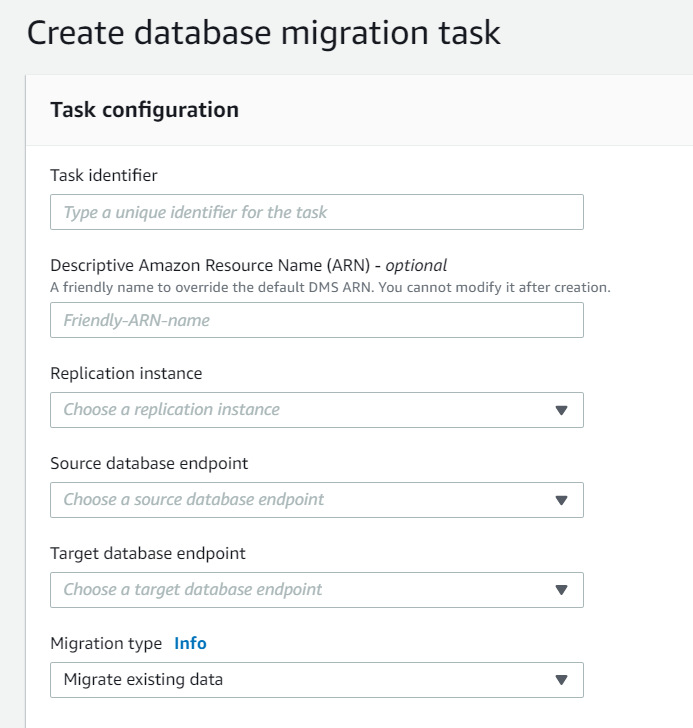 Truncate – In Truncate mode, AWS DMS truncates all target tables before the migration starts. Truncate mode is appropriate for full load or full load plus CDC migrations where the target schema has been pre-created before the migration starts. You can use the AWS Schema Conversion Tool (AWS SCT) to pre-create target tables for you. 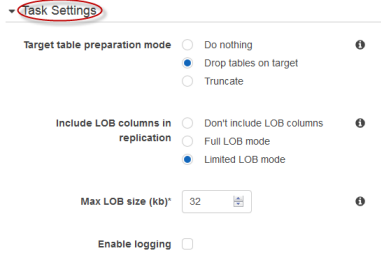 Don't include LOB columns – LOB columns are excluded from the migration. Full LOB mode – Migrate complete LOBs regardless of size. AWS DMS migrates LOBs piecewise in chunks controlled by the Max LOB size parameter. This mode is slower than using Limited LOB mode. Limited LOB mode – Truncate LOBs to the value of the Max LOB size parameter. This mode is faster than using Full LOB mode. In Limited LOB Mode, LOB columns that exceed the setting of Max LOB size are truncated to the specified Max LOB Size. Enables data validation, to verify that the data is migrated accurately from the source to the target. For more information, see Validating AWS DMS Tasks. Enables logging by Amazon CloudWatch. Do nothing – Data and metadata of the target tables are not changed. Drop tables on target – The tables are dropped and new tables are created in their place. Truncate – Tables are truncated without affecting table metadata. Don't stop – Don't stop the task but immediately apply cached changes and continue on. Stop before applying cached changes - Stop the task before the application of cached changes. Using this approach, you can add secondary indexes that might speed the application of changes. Stop after applying cached changes - Stop the task after cached changes have been applied. Using this approach, you can add foreign keys, triggers, and so on, if you are using transactional apply. 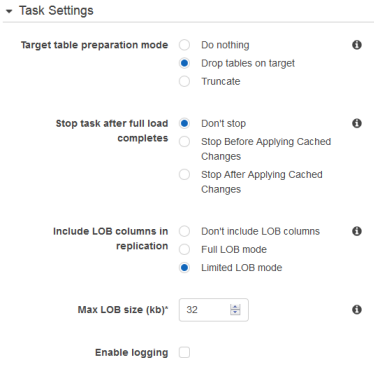 Don't include LOB columns – LOB columns is excluded from the migration. Full LOB mode – Migrate complete LOBs regardless of size. LOBs are migrated piecewise in chunks controlled by the LOB chunk size. This method is slower than using Limited LOB Mode. Limited LOB mode – Truncate LOBs to 'Max LOB Size' This method is faster than using Full LOB Mode. Choose the Table mappings tab, shown following, to set values for schema mapping and the mapping method. If you choose Custom, you can specify the target schema and table values. For more information about table mapping, see Using Table Mapping to Specify Task Settings. After you have finished with the task settings, choose Create task.